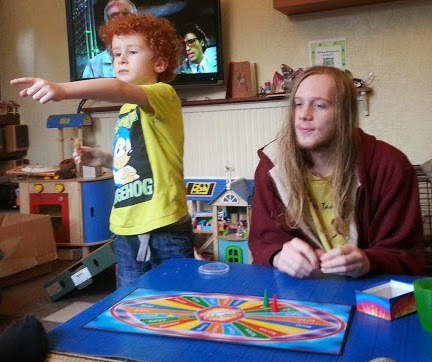 Drumond Park make fantastic board games and last weekend we got to play with two of our favourites. 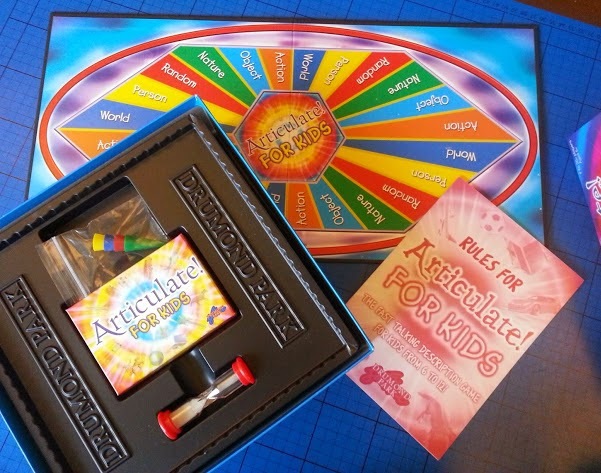 Articulate has been around for a long while, and it's junior version, Articulate For Kids, has just undergone a revamp which sees it suitable for children aged 6+. Our 6 year old is fairly articulate, but lacks nerve, so this is an excellent game for helping him gain confidence with description and memory. It increases a child's vocabulary and social skills. Play is very simple and in teams of 2 or more players - you will need at least 4 people to play. Place your counter on the 'start' space, then take the role of describer or guesser. The idea is to describe as many card entries as possible to your team mates in 30 seconds without giving "begins with" or "sounds like" clues. We really enjoyed playing. Our 6 year old loved it. He felt very special reading his word from the card and describing it to his team, and very clever when he guessed a word right that his team mate had described to him. 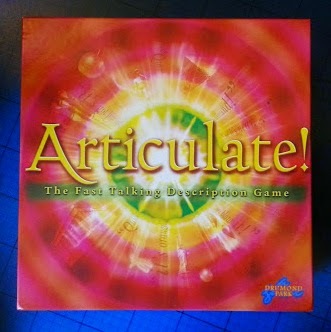 Articulate is the classic original game. 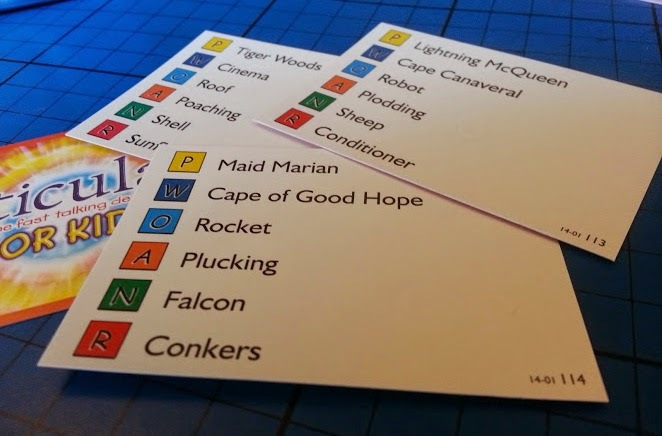 Play is very similar to Articulate For Kids, but with the addition of a spinner that can lead you to sabotage the other team(s) or massively advance your own team, and harder words printed on the cards. 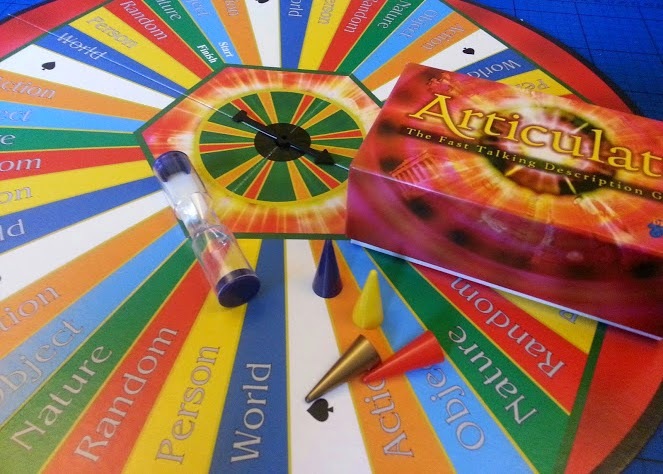 Questions in both games are in 6 categories - Object, Nature, Action, World, Person or Random, and there are thousands of different words in each game. The cards from both games can actually be used together so that younger players can join in with older on a more equal footing. 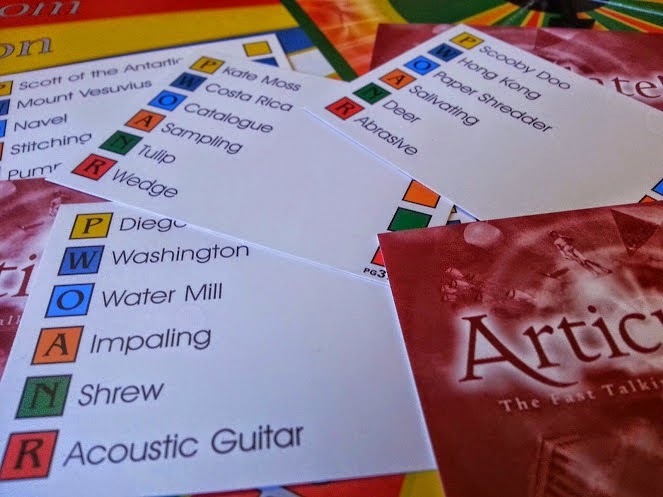 We really enjoyed playing, although moving from Articulate For Kids to original Articulate made it seem really hard! It was a good laugh and really fast-paced at times. One of the funniest bits was when the describer had no clue what they were meant to be describing. You're only allowed 1 pass each round, so use it wisely! I think playing expanded everyone's vocabulary - and general knowledge too. 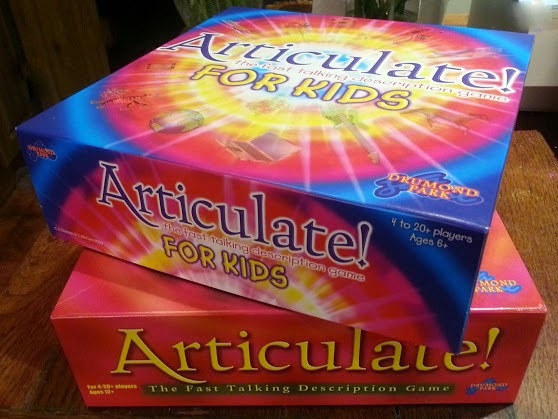 Articulate is recommended for age 12+ and has an rrp of £32.99 - and can be played with 4-20 players or more. 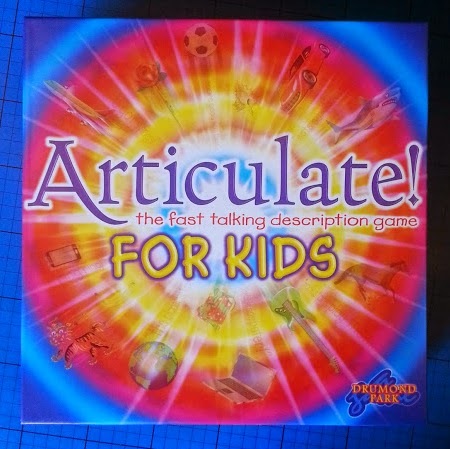 Articulate For Kids is recommended for age 6-12 and has an rrp of £19.99, again it's suitable for 4-20 players - or more. Drumond Park have very kindly offered me one of each game as a prize for one of my readers. 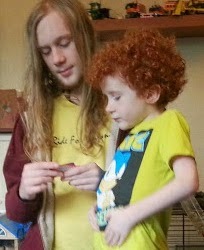 One winner will receive both games so that you can play with any or all members of your family over 6 years old. The prize bundle is worth over £50 and will be a fabulous gift or family entertainment this Christmas. The giveaway will end at midnight Friday 12th December (after which no further entries will be accepted) and I'll need the winner's details fairly promptly - Drumond Park intend to post prizes on Monday 15th December in time for Christmas. Further terms and conditions at the bottom of the Rafflecopter form. We were sent our games for review. Thing that flies with blade on top? A round flying machine with spinning blades on top. It flies and has rotor blades on it! Something that flies over our house.. Not an aeroplane but the other. Flies in the sky with spinning blades. Odd shaped flying machine with rotor blades. It Flies and has rotor blades. it flies in the air but the pepollers are on the top,it has wheels on the bottom to land on and people bend down when they get out of it because they think the propellers will hit their head. A powerful machine, used by the emergency services to rescue people. It flies and you have to be a trained pilot to fly it! Brill question! Its a flying machine that chopped off Romano's arm in an episode of ER and I've never been the same near one since! An aircraft with rotor blades that can hover and fly horizontally and vertically. It n fit a handful of people in it and has a spinning rotar on top. A wokka wokka, but not so specific! It flies in the air but it's not a plane. Police and Ambulance crews use them. It flies and has a spinning blade on top. Used a lot by military. A large metal vehicle with 4 blades on the top and tail that rotate very fast for flying. Something that flies and that has blades on the top. A flying machine that has rotating blades on top and is like Harold from Thomas the tank.